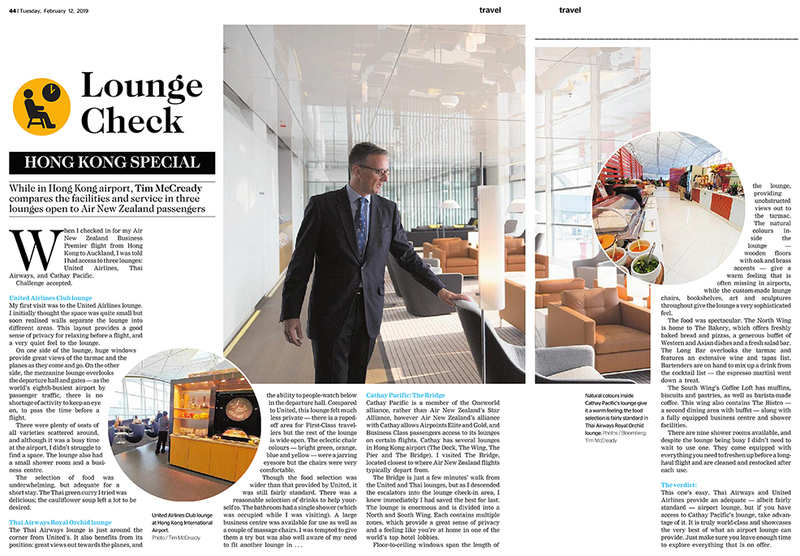 While in Hong Kong airport, Tim McCready compares the facilities and service in three lounges open to Air New Zealand passengers. When I checked in for my Air New Zealand Business Premier flight from Hong Kong to Auckland, I was told I had access to three lounges: United Airlines, Thai Airways, and Cathay Pacific. My first visit was to the United Airlines lounge. I initially thought the space was quite small but soon realised walls separate the lounge into different areas. This layout provides a good sense of privacy for relaxing before a flight, and a very quiet feel to the lounge. On one side of the lounge, huge windows provide great views of the tarmac and the planes as they come and go. On the other side, the mezzanine lounge overlooks the departure hall and gates — as the world’s eighth-busiest airport by passenger traffic, there is no shortage of activity to keep an eye on, to pass the time before a flight. There were plenty of seats of all varieties scattered around, and although it was a busy time at the airport, I didn’t struggle to find a space. The lounge also had a small shower room and a business centre. The selection of food was underwhelming, but adequate for a short stay. The Thai green curry I tried was delicious; the cauliflower soup left a lot to be desired. The Thai Airways lounge is just around the corner from United’s. It also benefits from its position: great views out towards the planes, and the ability to people-watch below in the departure hall. Compared to United, this lounge felt much less private — there is a roped-off area for First-Class travellers but the rest of the lounge is wide open. The eclectic chair colours — bright green, orange, blue and yellow — were a jarring eyesore but the chairs were very comfortable. Cathay Pacific is a member of the Oneworld alliance, rather than Air New Zealand’s Star Alliance, however Air New Zealand’s alliance with Cathay allows Airpoints Elite and Gold, and Business Class passengers access to its lounges on certain flights. Cathay has several lounges in Hong Kong airport (The Deck, The Wing, The Pier and The Bridge). I visited The Bridge, located closest to where Air New Zealand flights typically depart from. The Bridge is just a few minutes’ walk from the United and Thai lounges, but as I descended the escalators into the lounge check-in area, I knew immediately I had saved the best for last. The lounge is enormous and is divided into a North and South Wing. Each contains multiple zones, which provide a great sense of privacy and a feeling like you’re at home in one of the world’s top hotel lobbies. Floor-to-ceiling windows span the length of the lounge, providing unobstructed views out to the tarmac. The natural colours inside the lounge — wooden floors with oak and brass accents — give a warm feeling that is often missing in airports, while the custom-made lounge chairs, bookshelves, art and sculptures throughout give the lounge a very sophisticated feel. The food was spectacular. The North Wing is home to The Bakery, which offers freshly baked bread and pizzas, a generous buffet of Western and Asian dishes and a fresh salad bar. The Long Bar overlooks the tarmac and features an extensive wine and tapas list. Bartenders are on hand to mix up a drink from the cocktail list — the espresso martini went down a treat. The South Wing’s Coffee Loft has muffins, biscuits and pastries, as well as barista-made coffee. This wing also contains The Bistro — a second dining area with buffet — along with a fully equipped business centre and shower facilities. There are nine shower rooms available, and despite the lounge being busy I didn’t need to wait to use one. They come equipped with everything you need to freshen up before a long-haul flight and are cleaned and restocked after each use. This one’s easy. Thai Airways and United Airlines provide an adequate — albeit fairly standard — airport lounge, but if you have access to Cathay Pacific’s lounge, take advantage of it. It is truly world-class and showcases the very best of what an airport lounge can provide. Just make sure you leave enough time to explore everything that is on offer.